I mean, you know, in a platonic, Facebook sort of way. Well, you should. Moreover, if you’re a blogger, you should have a Facebook page — it’s a great way to get your content out to a larger audience and engage with new people. For those of you who aren’t following along on Facebook, you’re missing out on stuffed Yodas, random coffee mugs hots, the occasional homage to my dog, and a list of links that I share throughout the week. I mean, really like me? If so, click here and join the rest of the cool kids. If you already did this ages ago and are worried that this post was a waste of your time, fret not. You should consider having a separate page for your blog on Facebook, aside from your personal profile so that I (and others) can “like” you back. Facebook limits personal profiles to 5000 friends, so if (I mean when) your blog gets huge and you have more than 4999 fans, you’ll eventually need a Facebook page. Might as well be preemptive and start now. If you have a blog, then you should realize that you are not a computer. Your blog isn’t you. Neither is your business. It is impossible, regardless of how hard you might try, to cram all of the nuance and idiosyncrasies of you into a bunch of pixels or copy. Over half the content shared online is shared via Facebook. In fact, the main source of traffic for this blog comes from people sharing my content on Facebook. If you have a Facebook page, you can share your content with your audience and encourage them to share it with their own friends. I notice that even when just a few people share one of my posts on Facebook that can easily lead to a few hundred visitors — just from Facebook. Having a page allows you to grow a much larger audience than your own personal network would permit, and as your readers share your content, your content will go more viral via Facebook. Giving your blog a more permanent presence on Facebook only facilitates this. If you don’t have a Facebook page for your blog (it’s free! ), you should consider getting one. To get started, click here. Also, Copyblogger has a great guide for marketers and bloggers for using Facebook. Do you have a Facebook page for your blog, business, or something else? If so, share it in the comments. I do both, David. Worst case scenario – you now have two outlets to promote your blog. Not if you’re sharing content. They group it according to the content being shared, not the person sharing it. Just a suggestion…you could differentiate your “blog” page from your personal page by adding something like David Santistevan, Musician/Writer/Blogger (or whatever it is you want). I think that’s what Jeff has done. Right. That IS what I did, but I’m not saying that it’s right. For instance, Michael Hyatt just uses his name. If I ever became a public speaker, my page’s brand may not work. I dunno. We’re all figuring this out together. If you have less than 100 “likers” (I think that’s the number) on your FB page, you should be able to change the name of it. to my page in the first place “liked” the new page w/o any issues. That’s the mark of a true tribe. I don’t have a facebook page for my blog, but I will in about 20 minutes. I had one for my old blog and deleted it. It had over 1200 followers.. Kind of kicking myself for that one. Could of just switched the name to my new blog. Well here we go.. time to hustle with a new page. Yeah… (Biting my tongue) No use in having regrets; time to move forward! I reserved one a while ago but haven’t done anything with it. Have a little less than 2K friends on personal page [long ways from 5k] so I guess I don’t really know what value it’ll give me over my personal page. Do you link you blog both on the personal page and your ‘like’ page? Yes. It’s an investment and an exercise of faith. But here’s what I’ve found: even with only a couple hundred blog followers on my FB page, I’ve found that the majority of them are NOT my FB friends. So I’m reaching a new audience with this new outlet. I promote my blog thru both channels and end up reaching a wider group. I have an FB page for each of my blogs. I don’t accept friend requests from people I don’t actually know in real life, and I don’t like to overwhelm my IRL friends with blog updates and such, so having a page separate from my personal FB account is great. It also provides a place of community for my readers to interact with me and each other! I also manage social media accounts (including FB pages) for others. LOVE it! Love that separation, Ashley. Thanks for sharing. My blog page is much smaller than my friend page, but I definitely have a number of folks on there who aren’t my friends, so it certainly helps. I feel like I need to do more with my blog’s page. Right now it’s just the feed from my blog, which makes it pretty boring. I just don’t really know what else to DO on it that makes it worth clicking on. I agree. Same for me. Regarding what to do, I recommend trying to manually add your blog links, instead of using Networked Blogs. It can make a BIG difference on traffic. It requires some intentionality, but links that are shared via third-party services (like NB) get penalized. You might also try cross-promoting other content you’re reading. That’s what I do. Just liked your page, btw, Alise. Good stuff! You know, I had heard that about NB. I think I’ll go ahead and start doing manual links there as well (already do manual links on my “real” page). And I think I’ll do that. I tweet out stuff that I read from others, but adding it on my FB page makes sense. This was a tip that Michael Hyatt shared with me. I was dubious, but after trying it for a week and my Facebook referrals skyrocketing, I was sold. It’s worth it. And you don’t need a lot of “shares” for it to make a difference. Just a question: how would cross-promoting other content bring more exposure to your FB page? builds trust. makes it not seem so much like a megaphone, but rather a community. Succinctly said, Todd. You’re absolutely right! The timing of this post is great. I added a facebook page for my blog last week. I’ve been struggling to get folks to like it, but I guess it’s a slow process. I really think point 3 is the key. I too drive a lot of my blog traffic from FB and it makes sense to have a FB page focused completely on the blog. Plus, its a great place for further conversations. So all I have to say is… when are you gonna give me a like?! 😉 Thanks Jeff! Btw, try doing a blog post (if you haven’t already done so) about your FB page. My friend Jamie (https://theveryworstmissionary.com) did this and got 1000 likes in a few days. Thanks for the post and info… I’m on it! Rob…I have found that the more I use my blog FB page, the more likers I get. I still have only about 140, but I have increased my usage in the past few weeks and my numbers are only going up. very cool. i’m still learning about how to best leverage this. Hi Rob…yes, one thing I do is I always post a link to my new posts. FB is by far my biggest referral as well. Most people who don’t blog/tweet don’t use an RSS reader and FB is like that for them. So, I’ll write a little one sentence teaser about my post and have the link for them to click on. Does that make sense? If you go to my Pop Parables FB page (https://www.facebook.com/popparables), you’ll see what I mean. Jeff does this, too. But, also by “use my blog FB page” more I mean doing status updates, sharing things as well. I took a quick look at your blog (very cool btw), and I think for your readers it would be nice if you posted things like new music releases, questions about worship, even little tidbits abour your family/life. Anything that is an extension of your blog and you/your voice. I really hope this helps. I’m by no means an expert, but these are the things I do and the things I like/have seen others do. As Keri said, I do this, as well. I actually just started doing what she’s talking about — using Facebook with my page (instead of my profile). Great points Keri. I’ve been using my FB newsfeed to update and link to my blog and that seemed to work really well. I guess my FB page will do the same thing. Thanks for the advice… btw, nice blog! Right now I’ve got about 129 likers on my page. How often would you recommend to post something with that number of people without being annoying? I usually just posts the links to my newest blog post and occasionally an inspiring statement. No more than once per day, actually not even that much. What do you suggest? Kelly…I’ve been playing around with that, too. FB’ers don’t want a constant stream like with Twitter. I’ve found that posting 2-3x a day is good (including links to posts). But, I spread those out throughout the day. I’ve found that my readers are typically on FB early in the morning, around dinner time and late at night. I try to hit it at those times, and just respond to the comments otherwise. Maybe you could try that? I agree. Just a few times per day. It’s not like Twitter, and when you treat it like that, people tune out. With FB, you want to share a few things and get a lot of people to like them. With Twitter, it’s all about frequency. Early morning, dinner time, late at night. Got it. Couple times a day is fine. Sounds like a sound argument to me! Thanks, Peter. You should definitely have something like this, if you don’t already. Jeff – as always, I can trust you to deliver the goods! This is a great primer on creating a virtual loop that anyone building a platform needs to do. Personally, I really liked point #2 that we are not our respective blogs. I need to be reminded of that because I pour so much into writing that if I get a bad comment, it’s easy to take it personally – (sigh) I’ll take it up with my therapist. I do not yet have a fan page for my blog – but I have one for my forthcoming book that will be available in November 2011. I’m holding back on setting up a fan page for my blog until after its redesign – lame excuse, but it’s the best I’ve got. Not a bad excuse at all, Tor. One thing that I WOULD warn against is having too many properties to manage. For example, my page will serve as my blog page, as well as my page for any books I may write or articles I publish. You want to go deeper than wider with this type of thing, without confusing your audience. Food for thought. I’m an avid FB’er, personally and blog-wise. My best advice? Be sure to do more than share blog posts through FB. And, another excellent tip I have read is that FB is a place to “have fun” and “be social”. It’s kinda like a partaaaay. So, try to have fun with it and use it as a way to get your “voice” out there, by sharing thinks you like, asking readers questions, and just really getting to know your readers. I’ve found that a lot of the people who don’t want to comment on my actual blog will comment on FB-it’s just a different vibe there altogether and seems much more personal. Also, as I shared with Jeff on FB, I’m much more likely to share content through my FB page that is from another blogger’s FB page (NOT their personal page). Because I cannot even “be friends” with another person on my blog page. You can only ‘like’ other non-personal pages. So, if a friend has posted their blogpost to FB via their blog page, I can just click ‘share’-as easy as an RT! One more tip: the demographic on FB is MUCH different than on Twitter/blogoshpere. It’s a whole ‘nother group of people to get involved in your blog. Hope this helps! Indeed. Seriously, it sounds interesting. Feel free to email me about it! I’m not quite sure about something though. When people share your post, they’re not doing it with your fan page – they’re just hitting a “like” button specifically for that blog post, right? In other words, just because you’re getting a lot of traffic from Facebook doesn’t mean it’s due to your fan page, correct? That’s correct. BUT what a FB page DOES allow you to do is this: Share your posts with your friends and then with your blog audience (which can be different from your friends). When people “like” that share, it counts as another share – all of which gets calculated into the Facebook algorithm (yes, they have an algorithm like Google), which affects the ranking of a share in someone’s newsfeed. And when a lot of people share the same content, it increases the value of that link and will rank it towards the top of someone’s newsfeed (unless they have their settings different from the default). I’ve found that having a FB page for my blog has allowed my content to get more traction on FB, which has led to other people sharing it. Unlike many of you, my FB friends don’t resonate with a lot of my blog content, so building a separate community on Facebook around my blog was essential. Let’s put it this way, Martyn: When I DON’T share something from my blog on my FB page (even though it’s only a few hundred people), I can see the effect on my traffic. By the way, I think I liked your page twice. I switched from my private account to my page profile, and liked it both times. Facebook is so confusing. Just liked you! I do indeed have a blog FB page. Most of friends and family follow me through that or the listing on my personal FB account. I’m waiting to do more customization until I move to WordPress and do a design overhaul. I can’t wait! Blogger’s not bad – I used to use it, but WordPress.org is great for all the customization. Just liked you back, Leigh! Again, thanks for the ideas. Cool. I wouldn’t promote it a bunch publicly until it has some good momentum. You might begin by messaging some friends on Facebook to get a decent following, then do a more general appeal. People like to be a part of things that others are. Promote others more than yourself, but don’t be afraid to promote yourself. People are following YOU for a reason. Needless to say she got a ‘text full’ from me. I never thought to do this for my blog, but it makes sense. I post my band activity on a band page, why not my blog activity? Thanks for resources; always useful. yeah, why not? you’re welcome, stephen. as long as it’s not completely irrelevant, it may not be a bad idea to share some of your posts on your band’s page. Yeah, relevance is the key. When my personal life and work life are so closely related, a post can be relevant in both arenas. I’ve got other ambitions for our band blog once it’s up and running though. Eager to roll out our blog platform, I hope it is pretty fresh for music listeners. Adam – you might try doing a post dedicated to it. I did that today and already got over 40 new followers. I’ve been slowly playing around with the FB page idea for the past couple of months mainly to get an understanding of it before creating a page for my business. Am liking what is has to offer more and more and, as you said, it’s a whole different crowd than on Twitter etc. You’re welcome. Thank YOU, Eric. Some day I will be at your level of social media user. Do you think that if I transitioned to using a like page I could get a good amount of my friends that I currently have to like my new page? What would be the best way to get the word out to my current friends? I have had trouble getting updates out to all of my 600+ friends when facebook only puts my updates in the news feeds of the friends that I have had recent correspondence with. Is there a way around this? Hey Cortland, thanks for the kind words. The point is to not get just your friends to like your page but to build a whole new audience that you wouldn’t otherwise be able to reach. Other than individually inviting them, you could try doing a blog post or note on Facebook, announcing your page and why they should subscribe. Make sure that it’s clear why they should join and the value they will get from the experience. Regarding your last question: Facebook “ranks” what shows up your news feed by relevance, but you can always change this in your settings (I think) or by clicking “live feed” which will show you the most recent updates. If you want your posts to show up in all your friends’ feeds, you need to be: 1) Having conversations with them, and 2) Getting people to like your posts (that will also cause your updates to rank more highly). Not gonna lie, I only created one when I read this post…but here it is (https://www.facebook.com/pages/A-Secret-I-Wish-I-Couldnt-Tell-Marissas-Blog/229320830412424?sk=wall) Today, on my blog, I had a comment from someone I had never met before. It made me feel so special! haha love you. you totally are! love you, too. WAY late to the party but just added a facebook site for my blog today! I then stumbled across this blog post and am so inspired to utilize my FB page! Just wanted to say thanks, and that i’m heading over to ‘like’ your FB page now! Here’s mine if you want to check it out (day 1, so no judgment :)). Great post – thank you for the useful tips! I am starting out and I am loving the adventure so far. Hi Jeff, I’ve always wanted to have my own blog… I recently noticed that a lot of the blogs who have there own facebook pages definitely have huge audiences as it’s easier to like a page and share the pretty pictures and quotes they post instead of going onto a website. I have always wanted to have a blog but prefer using facebook instead of blog sites. I started a facebook page a week ago dedicated to glamour, style, beauty, seduction, well-being and travel. I have been posting pictures and quotes that I like. I am hoping to build an international audience and have over 30 fans who I don’t know already which I am happy about. Do you think I need to create a blog on an actual blogging site or can I use facebook as an online facebook blog which is what I am currently doing? I thought it was a good idea and something a bit different as for me a facebook page is much quicker- Looks like I’m doing everything the opposite way around. I’d love to know your thoughts on using a facebook page as your blog. I was going to connect instagram to it soon as well and will be posting outfits that I wear that I think are awesome. haha! 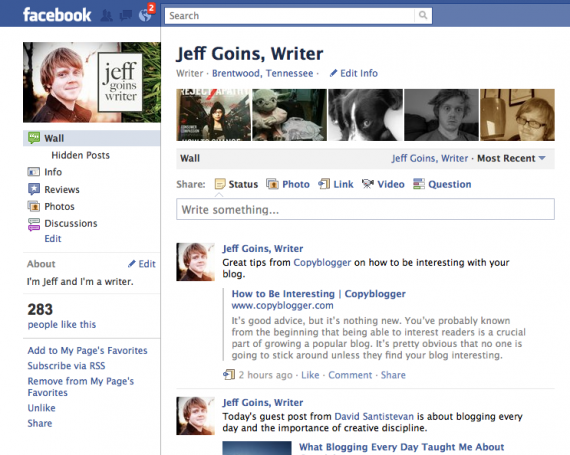 Hi Jeff, what is the difference between Facebook Page “blogger” and “personal blogger”? Is there any differences to both? I have a facebook page for my website blog page….is that okay?